GOAL: To provide a supervised, Catholic environment before and after regular school hours for the students of St Ann Catholic School. REGULAR HOURS OF OPERATION: Before Care is 7:00am until 8am. After Care is 3pm until 6pm. PAYMENT PROCEDURES: Any family wishing to change from monthly to hourly, or hourly to monthly, should give two weeks notice to the Director. All fees paid are non-refundable. No refunds will be given due to severe weather or absences (illness, trips, etc.) Payment must be made by check payable to St. Ann Before/ After School Program. Please send payment in an envelope marked: Director-Before/ After School Care Program. LATE FEES: After school Care closes promptly at 6:00 PM. A late charge of $5.00 per student for every 5 minute period after that will be assessed and added to the monthly or hourly bill. 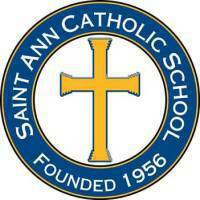 DISCIPLINE: St. Ann Catholic School discipline code also applies to the Before & After Care Program. Please consult the Student Handbook for details. EMERGENCY INFORMATION: Parents are responsible to keep all registration and emergency information current. Notify the Director (even if you have notified the school) of any changes as soon as possible. EMERGENCY CLOSINGS: If school closes early, due to severe weather, After Care will be closed. If weather conditions become severe during After Care, parents should pick up their children as soon as possible. If school is delayed in the morning because of severe weather, Before Care will open late also. You will be notified through School Reach for any changes in schedule due to weather. ALL STUDENTS ATTENDING BEFORE/AFTER CARE DURING AUGUST ARE BILLED AN HOURLY BASIS.